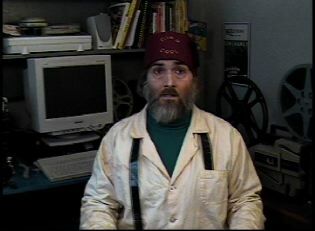 Dr. Film: He is the honorary head of the Midnight Film Society, a group that seeks out obscure old movies. This is because he has a great collection of movies, and not because anyone at the Midnight Film Society likes him. In high school, you would have liked to beat this guy up--after you made him do your algebra homework. He's pretty sharp and he knows it, but lets be charitable and say he's lacking in the finer social graces. He does know his stuff about film, and he will talk about it endlessly with great enthusiasm. Unfortunately, film is the only thing that gets him very excited. He will skimp on anything and everything to make sure his collection of old movies is kept safe. He works from the Dr. Film Control Room above the basement film vaults, where his assistant Anamorphia is stationed. Anamorphia: Like Jack Benny's assistant, Rochester, Anamorphia is really more competent than her boss. It is she who keeps the vaults organized and finds each reel for Dr. Film. Her knowledge of film history may not be quite so extensive as his, but she doesn't toot her own horn the way he does. Dr. Film and Anamorphia have never gotten along very well, because she thinks he's a blowhard cheapskate and he thinks she's an ungrateful employee. This is probably a fair assessment on both sides. She takes a special delight in baiting him and in cutting him off when he starts to ramble about some bit of film trivia. Not only does this keep the show moving, but it also keeps him from going off the deep end. Anamorphia never seems to leave the basement. All of Dr. Film's orders are barked at her through a hole in the floor between them. We only get to see her through a peep hole that looks like a submarine periscope. Heaven knows why Dr. Film has rigged up such a contraption.